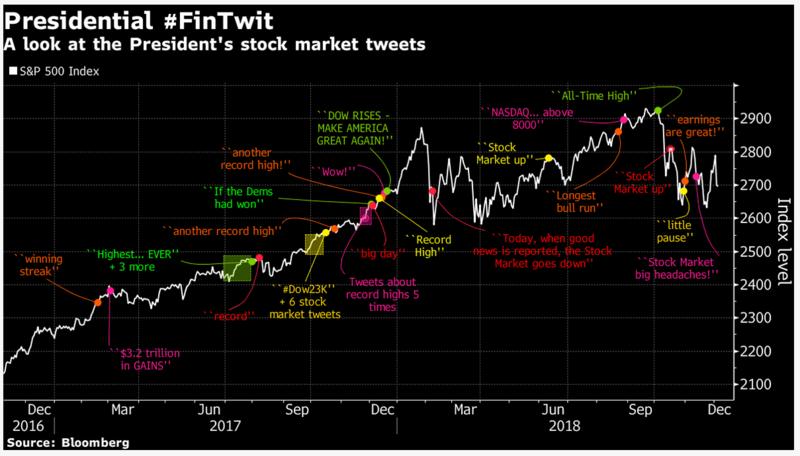 (Dec 24): Nobody was happier to take credit for surging stocks than Donald Trump, who touted and tweeted each leg up. Now the bull is on life support and the search for its killer is on. And while many on Wall Street share the president’s frustration with the man atop his markets enemies list, Federal Reserve Chairman Jerome Powell, they say Trump himself risks making things worse with too much aggression when equities are one bad session away from a bear market. Treasury Secretary Steven Mnuchin moved to reassure markets late Saturday that Powell wouldn’t be ousted, after four people familiar with the matter said Trump has repeatedly discussed firing the central bank chief in recent days. In a pair of tweets, Mnuchin quoted Trump as saying: “I never suggested firing Chairman Jay Powell, nor do I believe I have the right to do so.” White House Budget Director Mick Mulvaney on Sunday echoed the comments. To be sure, equities remain solidly higher since Trump took office. Even with its 17% drop over the last three months, the S&P 500 has risen 18% since Election Day. The Nasdaq Composite Index is up 25% with dividends. True, volatility has jumped to a 10-month high, but market turbulence was significantly worse for three long stretches under Barack Obama. The S&P 500 slumped 7.1% last week and the Nasdaq Composite Index spiralled into a bear market. As of 2.31pm in Hong Kong, futures on the S&P 500 were up 0.6% while Nasdaq 100 contracts added 0.5%. While Trump seems to have found his villain in Powell, blame is a dubious concept in financial markets, as anyone who has tried to explain the current rout can attest. Along with the Fed chairman, everything from rising bond yields, trade tariffs, falling bond yields, Brexit, tech valuations and Italian finances have been implicated in the downdraft that has erased $5 trillion from American equity values in three months. Whatever’s behind it, nothing has been able to stop it. And while many on Wall Street credit the president for helping jump-start the market after taking office, they say he should look in the mirror to see another person creating stress for it right now. If Trump is bent on getting rid of Powell, there may be ways of doing it that don’t risk kicking a volatile market into hysteria, said Walter “Bucky” Hellwig, a senior vice president at BB&T Wealth Management in Birmingham, Alabama. For now, the turmoil shows no signs of letting up. In the Nasdaq 100, home to tech giants like Apple Inc. and Amazon.com, there have been 17 sessions with losses greater than 1.5% this quarter, the most since 2009. Small caps are down 26% from a record, while the Nasdaq Biotech Index has dropped at least 1% on seven straight days, the longest streak since its inception in 1993. It’s been a long time since anyone in the US has lived through this protracted a decline. Including Trump.